Most of you have had this conversation if you have stayed in a hostel. Or heard it from friends who have stayed in hostels. The best years – undergrad life – was flanked by the most atrocious food ever. 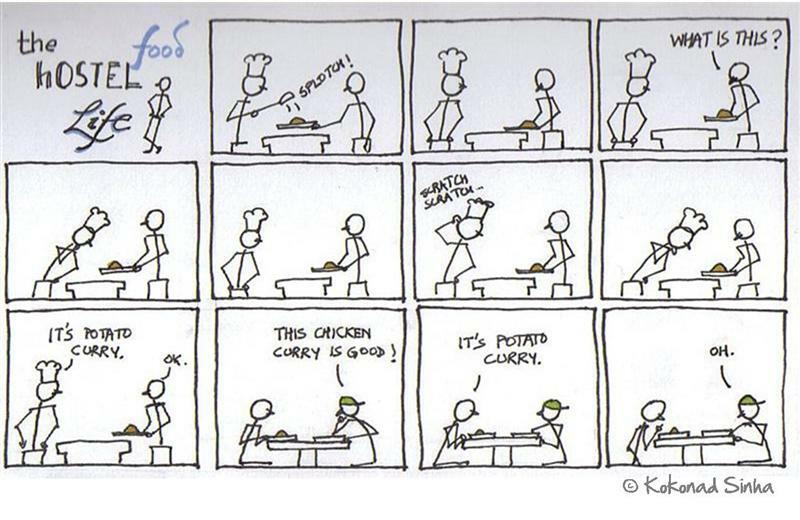 Everyone has a hostel food story. It’s the only kind of story everyone will believe an outrageous exaggeration too! My hostel had the most exquisite food menu ever – we had biryani on Sundays, saambaar rice on Mondays, puri-chhole on Wednesdays, paneer dishes on Fridays, rawa dosa on Saturdays etc. Every semester started with brand new promise of the chef’s love – but soon after the first week, we could only tell these apart because we knew what was being cooked that day. Such was life. Then one day, a new caterer came. The cook showed promise – he was a beacon of light, a ray of hope, the sun through the clouds, rain on the desert sand, a bowl of soup. He brought together the best of spices, and the freshest of vegetables, the sweetest of aromas… but God only knows what he did with them, because nothing changed for us. We used to lovingly call our hostel food – grub. Among the things that we found in our food across the years of undergraduate study – small branch in sambaar, spider in daal, unknown insect in rice, stapler pin in dosa, cockroach in baingan bharta, aloo in aloo parantha and a cat. Ok, I am kidding about the last two. Some guy said that there were regular sticks instead of drumsticks in his food – but no one else was sticking to the story of the sticks. It did turn pretty sticky towards the end. 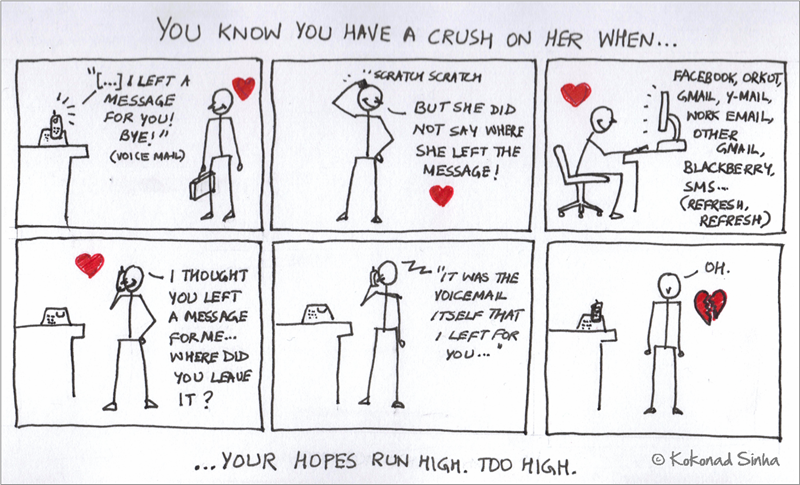 One way crushes are probably the most agonizing of things ever experienced by man (and woman). Literally everything that happens to you that is remotely connected to her/him, it is blown out of proportion in your head heart. The number of hours you have wasted on this pointless imaginary romance – which finally actually got nowhere – you wish you somehow get those lost school years back. OK, college years too. OK may be some of your work years as well. I just noticed that several of my Thoughts in 2D and The Occasional Doodle have a lot to do with relationships. I wonder what to make of that.